There are many technological revolutions of varying impact that we will see in the next decade, in fields ranging from entertainment to automobiles to longevity to nanotech to telebusiness. One of the largest revolutions, however, with the potential to improve fuel costs, electricity bills, greenhouse gas emissions, dependence on foreign oil, workplace productivity, and consumer confidence will happen where you least expect it - in the humble light fixtures of your home and workplace. There are two technologies that have existed for decades, but are reaching cost and quality levels that can displace traditional incandescent lightbulbs. Compact Fluorescent Lightbulbs (CFLs) and Light-Emitting Diodes (LEDs) are both reaching prices of under $2.50 each per unit. CFLs and LEDs not only consume only about 20% of the electricity of a traditional bulb, but can last up to 8 times as long, saving the time and hastle of 8 bulb purchases and replacements. Of the 2 billion bulbs sold in the US each year, CFLs have jumped from just 1% of the total in 2000 to about 5% in 2005, or 100 million units. To accelerate adoption, Wal-Mart, often a critical catalyst for technology adoption, will start a major education and marketing campaign to sell another 100 million CFLs in the next 12 months. Let's run some numbers to illuminate the magnitude of this. If the typical household's 20 bulbs average 60 watts (.06 kWh) each and are used for an average of 4 hours a day each, and electricity costs 10 cents per kilowatt/hour, the household spends (20 x .06 x 4 x 365 x $.1) = $175.2 a year. CFLs would save 75%, or $131.4 in electricity costs for such a household each year. Since the electricity consumption curve is not linear and demand is somewhat inelastic, this benefits lower-income households greatly. At the macro scale, if each of the 2.2 billion bulbs in operation in 110 million households is aggregated, they consume (110m x $175.2) = $19.3 billion in electricity a year. CFLs would save 75% or $14.5 billion for consumers per year. In an age of fears about oil imports and atmospheric pollution, people are very wary of the amount of gasoline they consume, but usually have no idea how much oil and coal go into producing the electricity they use. A single 60 Watt bulb used 4 hours a day for a year requires the burning of about 70 pounds of coal. 2.2 billion incandescent bulbs would require 77 million tons of coal per year, and CFLs could reduce 58 million tons out of that, or 6% of total US coal consumption. The emissions savings alone would be the equivalent of reducing US automobile driving by 15%, or about 25 million cars. LEDs offer similar benefits in energy savings, and while they are not going to benefit from a push by Wal-Mart, are still a neccesary presence as a rival technology to CFLs, each mutually forcing the other to keep up the rate of innovation. One of these two, if not both, will sweep across the world in the next 24 months. Beyond the lighting revolution in the home, there is also one in the offering for the office, where tubelights, rather than bulbs, are currently used. This brings us to the third technology of this discussion. A company called Sunlight Direct has a brilliant product that distributes sunlight indoors, no matter how far from a location is from a window. The solar lighting system consists of a roof-mounted 40-inch light-collecting disc that moves to follow the sun during the course of a day, and plastic fiber-optic cables that distribute the light throughout the interior of the building. After the costs of the initial installation, this will not only save businesses the cost of artificial lighting during the day, but will greatly increase the quality of life of employees who can be freed from their tubelit torture. Large retailers stand to save over 20 cents per square foot per year in electricity through the use of this system. Wal-Mart, for example, has about 3000 stores averaging 150,000 square feet each. This amounts to (3000 x 150,000 x $.2) = $90 million in electricity potentially saved per year. The product will be commercially available by 2007, with the possibility of a residential version by 2009. Of course, some geographies stand to benefit more than others, as we can see from this handy map of US solar energy intensity (from Wikipedia). But taking the marketing even further, we can note that some fast-emerging economies with acute energy shortages also have abundant sunlight, much greater than even in the Southwestern US. A product like Sunlight Direct's is very compelling in India, VietNam, Thailand, and Taiwan, where electricity costs are often much higher than in the US, but near-continuous tropical sunlight is the norm. All three of these new technologies, and their descendants, will combine into a gale of creative destruction that will shake up a part of daily life that has been essentially unchanged for several decades. Unlike many other such disruptive technologies, the displacement and digestion process will be almost painless and nearly seamless. We all will be the richer for it. Update (5/29/07) : A CNet article has more details on various lighting technologies. How about the cost benefit of LCD computer monitors replacing CRTs? Same for TV? I'm trying to believe, but I just don't get it. All the cost reductions that these new technologies cause will just go into the wallets of Wal-Mart and GE. There will be no mass benefit to the workers. True, Wal-Mart and GE shareholders will get to spend more of their wealth, and it would trickle down to the workers. Also true that without the incentive of pocketing these cost reductions, Wal-Mart and GE would not attempt to invent new lighting technologies. But is the trickle-down benefit all that I will get? As per the article, you will receive a sizable reduction in your electricity bill. This also reduces the emissions of greenhouse gases by reducing the amount of coal burned. IDGI, in addition to the energy savings (pretty damn significant in and of itself), the bulb lasts longer so you buy fewer of them. Yes, this is a good thing. Not everything is a conspiracy on part of corporations. IDGI, by your reckoning, we should have banned steam shovels because it put human labor out of work. We should have banned Accounting and word processing Softwares because it put a lot of accountants and typists out of work. How about banning cranes backhoes and bulldozers? Caterpillar and Microsoft got rich. You got nothing? I accept all these things. But does technological progress necessarily imply a general increase in life comforts? I hope it does, but what about those Japanese that die at their desks from overwork? What will keep our future from turning into Blade Runner? Just saying "this is a technological improvement" does not automatically mean peoples lives will get better. However, in this particular case, it has been explained quite well why it will make our lives a bit easier (electric bill goes down, bulbs last longer so you buy fewer of them--every little bit helps). Superb article, btw. I really liked it. This weekend I went out and bought a pack of these bulbs. It takes about half a second to a full second for them come on when you throw the switch. But when they come on they are, in my opinion, indistinguishable from regular incandescent lights. They don't flicker like flurescent lights. I've only had them a couple of days, but I already like them. I don't think I'll go back to regular light bulbs. That's great. Let us know if your bill comes down significantly over the next couple months, beyond what it was for the same months last year. There are still kinks to work out in those CFL's. I adopted them as replacements for lighting in a large finished basement and some hard-to-reach areas (high ceilings, et cetera), replacing screw-in incandescents. Some few of the bulbs I never replaced again over the course of four years, most seemed to last about 2 years, and others I replaced every two months to a month - apparently there were particular outlets or fixtures that they didn't get along with. The hard-to-reach ceilings I did in particular because of the claims of long life. I did not realize a benefit there - I was up on ladders replacing those bulbs again and again. Also significantly more (say 10%) of them failed to work out of the box and needed to be returned - and as I don't have time for that sort of thing, they got thrown out, and I was out my 'investment' in them. They also generated a lot of heat - you couldn't handle the things if they had been on for half a minute (I had been hoping that they would run significantly cooler), and sometimes emitted an audible buzz or whirr - which is annoying in work or sleep areas. I was using bulbs the equivalent of 100 and 150W. Would I try it again? Probably, but I don't think I recognized any savings. I would just be hoping that the technology had improved. I agree that this is very good news. But total electricity costs will not decline. We will simply find new/better ways to use the electricity. Cost per kWh has dropped faster than the increase in kWh consumed per home. Good article - thanks for sharing this info. I was looking for CFL info and stumbled across it. If it isn't too forward, I wanted to draw your attention to the CFL project my company is running called "OneBillionBulbs.com" - we are trying to provoke some social change by increasing awareness on the benefits of CFL bulbs. I hope you won't think I'm spamming your comments with this info but I didn't see any other way to send you a message. I can't feel sorry for someone unwilling to return defective merchandise for exchange or refund. Someone "out his investment" might just as well give the receipt and the defective light bulb to some kid who could use the money and go see a movie on the refund. It's the principle, folks; nobody deserves to make money by selling "durable" goods that go into a landfill because they don't work. Such should cost money to the manufacturer and serve as an indicator that someone needs to pay attention. There will be flaws in any new technology, which explains the wisdom of not buying into anything new. Once the production lines lengthen and the flaw rate abates, the prices come down for anything from CD players (which once sold for as much as $1000; it's hard to find a true CD player except in an ultra-cheap portable stereo, and most people who want one now have to "settle" for a DVD player available for as little as $30. The DVD player plays not only DVDs but also recorded movies, which is a nice bonus. LEDs could win that battle because they last longer than CFLs. While I reading this blog, I feel I'm in the year 2125 I think that's the year that all traditional thing was replace. Like the now we must used all things that nature lover or that save our energy.. Thanks for sharing like this. This is so helpful to other..
What about all the mercury in the CFL's, are the manufacturers or retailers accepting responsibility for containment and recycling or is this just further environmental collateral damage that nobody (not eeven governements) want to acknowledge or address? LED's at least have a lower environmental footprint than CFL's and last considerably longer but it could be like the VHS-versus-Beta technology battles of past, where the best technology does not necessarily win out, rather the marketing muscle and investment incentives of the manufacturers and retailers pushes the most profitable technology, which of course in this case would be the cheaper option with the higher sales cycle time (shorter life = more sales = more revenue = larger corporate profits). 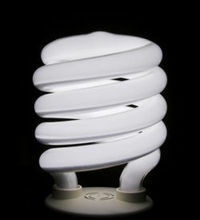 It is estimated that every CFL contains 5mg of mercury. Excluding the volume that get released accidentally when CFL's are broken and any small percenbtage that actually have a recycle path (most countries operate a voluntary system = no incentive and therefore low volume), the vast majority will end up in landfills and ultimately in the human food change causing further detrimental health effects). It's not like we actually need to further lower the IQ of the population including political decision makers. This is shaping up to be an environmental time-bomb for the 21 Century.